Q: Why should I have my windows cleaned professionally? A: Having your windows cleaned professionally on a regular basis will prolong the life of your windows. Over time your windows can become pitted and etched from hard water spots if left neglected. Professionals clean windows with precision and speed without leaving streaks or residue behind, ultimately saving you the time and hassle of cleaning them yourself. Q: Are you licensed and insured? If so, what types of insurance do you have? A: We are fully insured. We have a $5 million Liability Policy, and every technician is covered by workers’ compensation. Q: How long has Affordable Window Cleaning Company been in business? A: Affordable Window Cleaning Company has been in business since 1993. A: All of our services are backed with a 24 hour satisfaction guarantee. If you are not satisfied, please contact us. Q: How do I count my windows? 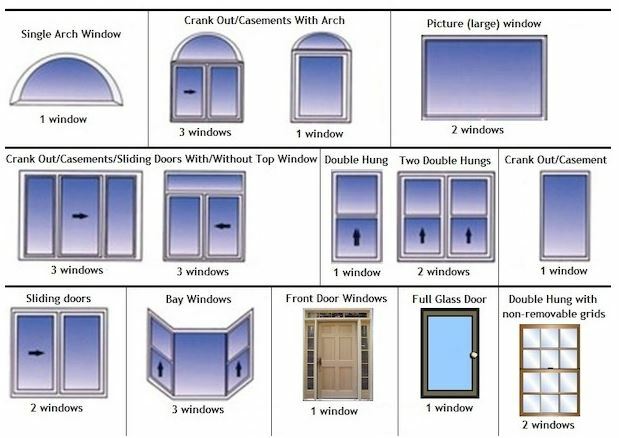 A: See chart below on how to count your windows. Q: Can you clean the inside of my windows, or just the exterior? A: We can clean both, whichever you prefer. Our uniformed professionals are trained to work carefully and safely on the interior of your home. That means your furnishings, floors and window treatments will be left just the way we found them, undamaged and clean! Q: How often should I clean my windows? A: The environment in which you live will play a big part in determining how often you will need your windows cleaned. Your windows will display the effects of dirt, dust, pollen, bugs, acid rain, salt and bird droppings. Your Affordable Window Cleaning staff will evaluate the condition of you glass and provide you with a plan to keep your windows clean all year round. Q: What causes hard water spots and stains? A: Hard water stains can result from a variety of situations, including sprinklers, condensation, building run-off, chemicals, and oxidation from metal screens. Over time, mineral deposits in water collect on the glass and appear as a hazy white or sometimes yellow film. If left on the glass, this film will etch the glass over a period of time.